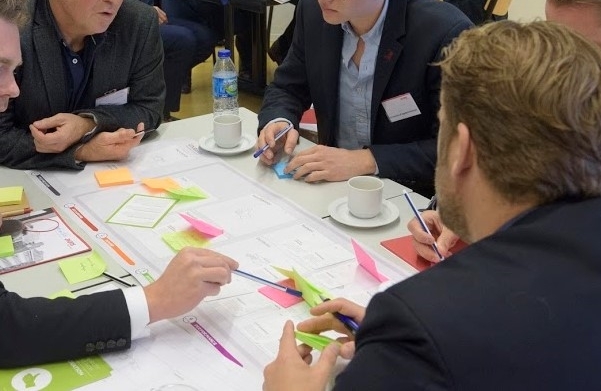 The Business Innovation Kit supports moderators and experienced entrepreneurs to review their shared values and to apply them as a lever to drive innovation. 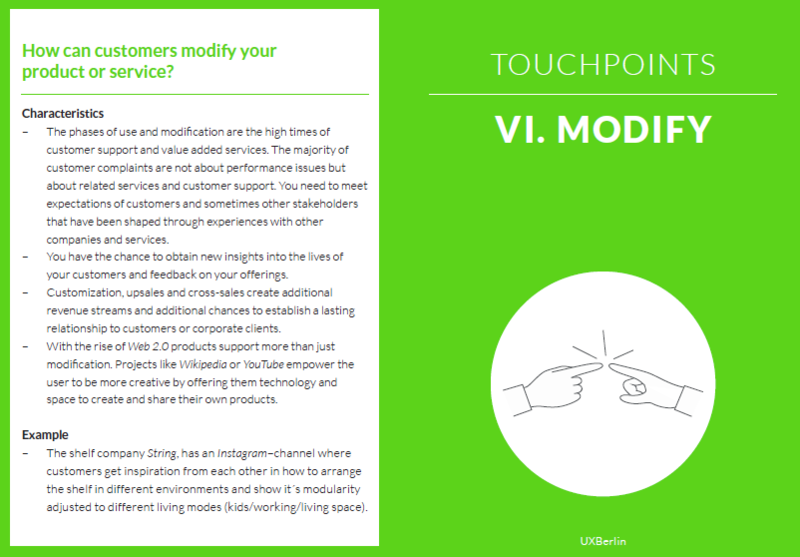 In a team you can explore, discuss and define the range of values-based business models for a new or existing business. Dedicated exercises enable you to specify viable revenue models, to walk through the customer journey, and to differentiate normative orientations like commitment to sustainability or values of privacy in a structured way. What you need: A business idea or an existing business, 4 to 10 participants, depending on the scope 2 to 8 hours for completion. What you get: A shared view of values-based business models for your business idea, or further development of an existing business. 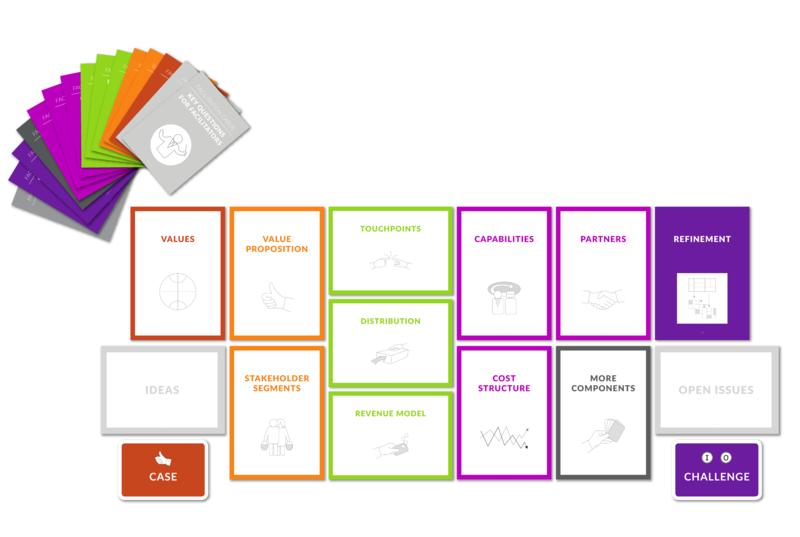 What it contains: Different cardsets for instruction, ideation, and challenges, also a a modular playground, corporate sustainability cards, revenue modelling and touchpoint cards. Modular Playground: Create a path for collaboration by attaching selected playground cards (13 in total) onto office walls. Move with the workshop participants from one station to the next: Discuss and agree upon the fundamental values and purpose of your business idea, familiarize with the business model components through examples of other companies, conduct a brainwriting session to collect ideas for each components, select and combine the best ideas on refinement sheets and face some of the challenges that may threaten your ideas. Corporate Sustainability Cards: 15 cards inspiring new ways how business may profit from sustainability-orientation with respect to five maturity levels of sustainability innovation. First, select the target level. 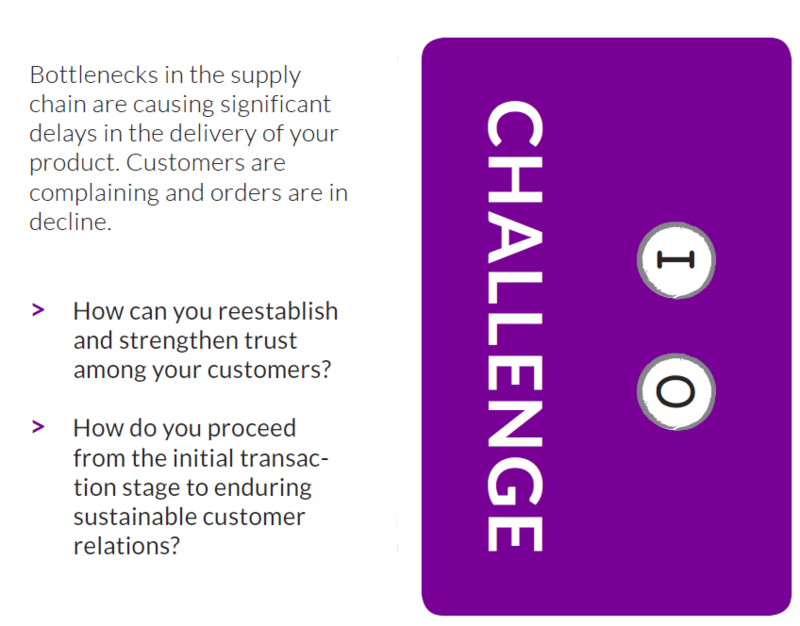 Then, reflect for each of 8 drivers of sustainable business cases on how to enhance sustainability in each component and their interaction within the business model. We are proud to develop the sustainability innovation toolkit in close collaboration with Florian Lüdeke-Freund, University of Hamburg. 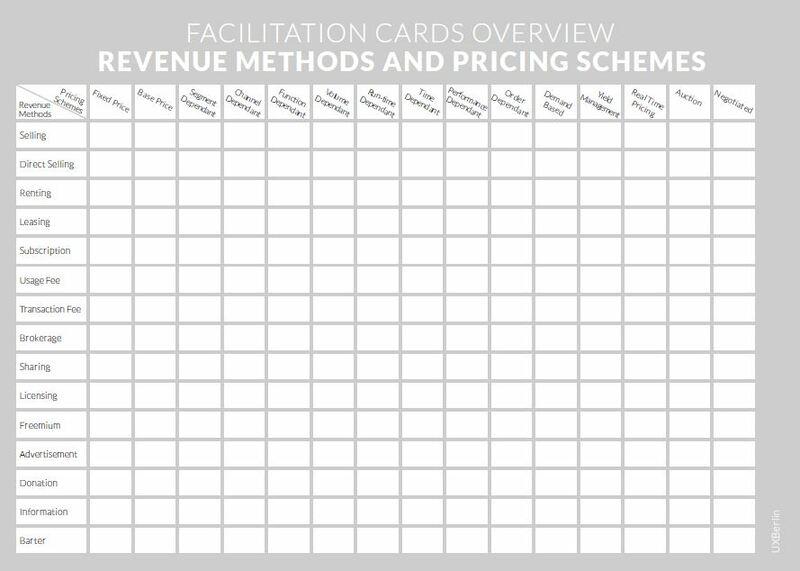 Revenue Modeling Cards: 33 cards to explore the most common revenue streams and pricing tactics. 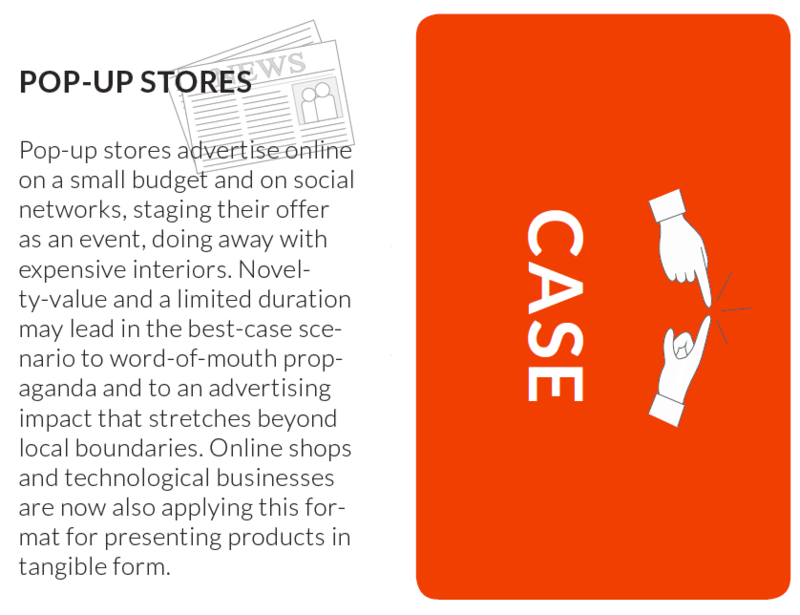 The key revenue and pricing patterns are presented and negotiated through drivers and examples. Revenue modeling cards ensure that the scope of potential revenue models pertaining to the business in question are covered. 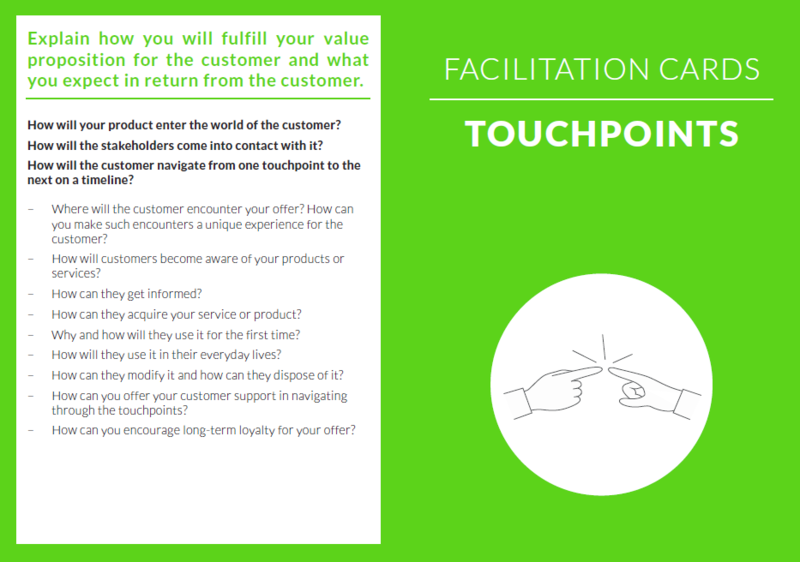 Customer Journey Cards: 9 cards to capture insights and model touch points with customers, stakeholders and the whole journey. A free basic version of the toolkit is available. 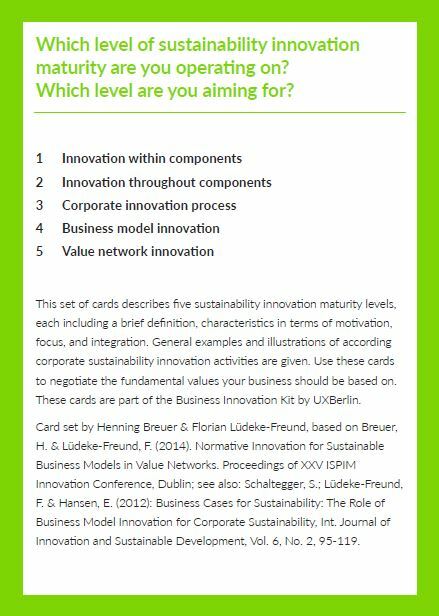 You may access our article on Values-Based Network and Business Model Innovation demonstrating and explaining work with the Business Innovation Kit in the context of modelling sustainable business ecosystems. Also check out our comparison of the 6 essential tools to model sustainability-oriented business. 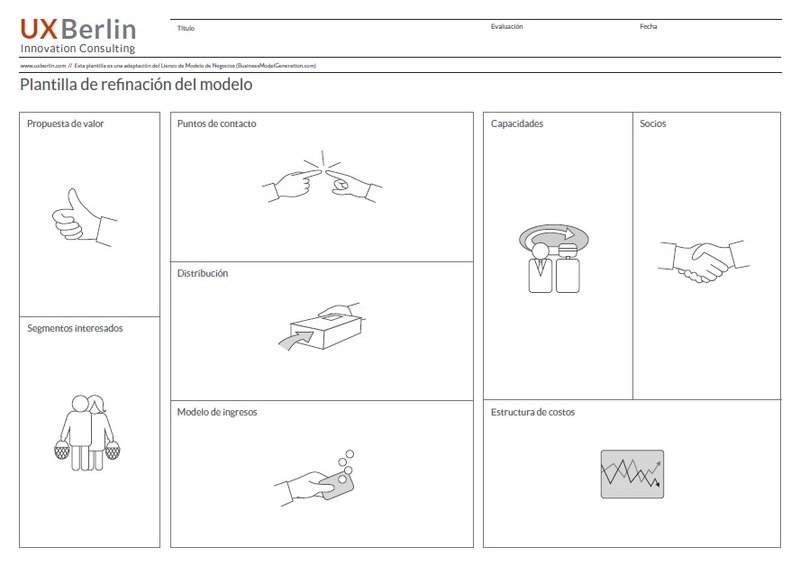 To order the toolkit (Update 2019) please send us an email with your shipping address, billing address and tax ID, and we will send you the comprehensive English version (at 79€ costs of production plus shipping). Basic card sets are also available in German, Spanish and Polish.